A high-end router without the high price tag. The best performing wireless routers on the market carry premium price tags, some of which run north of $300. If you're not willing to drop that kind of cash on a router but still want one of the fancier models, you generally have two options—try to score one on a heavy discount during Black Friday or Cyber Monday, or pick up a refurbished model. Well, Black Friday and Cyber Monday have come and gone, but if you're willing to chance a refurb, Newegg has a killer deal going for the Asus RT-AC3100. Newegg has the router in refurbished form on sale for $140, down from its listed price of $280. And if you use coupon code NAFCRPTF02, it will shave another $10 off, bringing the total to $130. A new model typically sells for at least $100 more—Amazon has it listed for $245 and Best Buy is selling it for $250. The RT-AC3100 is a dual-band router rated to deliver up to 2,167Mbps on the 5GHz band and up to 1,000Mbps on the 2.4GHz band. It supports MU-MIMO, meaning compatible devices can each have their own dedicated full-speed Wi-Fi connection. Asus also touts built-in game acceleration, which is supposed to reduce packet loss and lower ping. "The path gaming packets take once they leave your network affects ping time and stability. Inefficient hops lead to inconsistent ping and packet loss. The RT-AC3100 features a built-in WTFast client to access the GPN: a private network of route-optimized servers to ensure consistently low ping times," Asus says. As with most routers, the RT-AC3100 has a built-in four-port switch. It also has two USB ports (USB 3.0 and USB 2.0) for connecting external devices, such as a storage drive or printer. 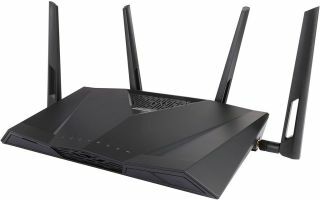 The warranty on this refurbished model is 90 days, along with Newegg's 30-day window to return the router for a refund or replacement. Newegg also offers a one- and two-year extended replacement plans that run $12 and $24, respectively. At this price, it would be worth adding one of those plans. Go here to grab the Asus RT-AC3100, and don't forget to use the coupon code.